Pioneers in the industry, we offer automatic high-speed partition slotter, corrugated box stripping machine and corrugated box waste removing machine from India. 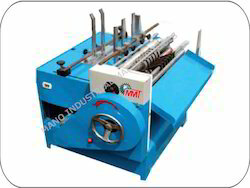 XL Automatic high-speed partition slotter is special equipment for carton clapboard, it is mainly used to slot 3 ply 5ply corrugated cardboard and hard paperboard. Feeding accurate, wide work range and adjusting range, adaptable, efficient.